As this journey nears its end, I found the perfect place to reflect upon the past three weeks. It's been amazing! Virtually unbelievable! So with only four full days left, I set out to make up for lost time. Today was crazy. I started out at Kyoto with the intent to see as much as I could in 2 hours. With so many places to choose from, I only had time to visit Kinkakuji. I had been here several years ago, but I really wanted to show all of you its breathtaking visual. I think the pictures say it all. I even met a deaf mute man that gave me a taxi ride I'll never forget. Then it was off to Tenri where everything moved slow and didn't open until night. I must have walked for at least an hour in search of the elusive Tenri Ramen. 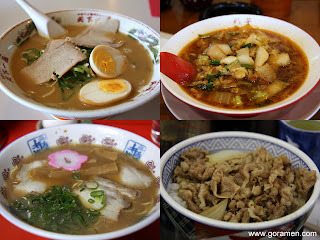 Seriously, the nearest ramen-ya to the station open for lunch was roughly 2 miles away. After a quick slurp and quick retreat from Tenri, I made the 2-hour train trek back to Wakayama. I wasn't gonna leave until I ate at Ide Shoten and man was it worth it! Finally, it was back to Osaka for the night where I decided to enjoy a 280 yen Yoshinoya Gyu-don. Don't ask me why. It just felt like the perfect ending. So without further ado, I give you the daily slide show. Next up Nagoya and the hot springs of Atami...oooh yeah. No I must have missed that one. I was in a hurry. Next time...I'll be back someday. I loved Kinkakuji as well when I went. Ide Shoten looked so good. My instant version isn't the same, but it was oishii (arigatou! :). Nah I didn't take that pic. Thought I might get cursed...hahaha.